BLOOMFIELD HILLS, Mich., Jan. 27, 2012 /PRNewswire/ -- PulteGroup, Inc. (NYSE: PHM) -- The dream of home ownership will become a reality for retired U.S. Air Force Captain Jason Vest when he and his family receive the keys to a brand new, mortgage free home today in the Centex community of West Fork Ranch located in North Fort Worth. Through the Operation FINALLY HOME program and donations from PulteGroup, Captain Vest will now own a house in which he and his family can feel secure as they return home to Fort Worth. PulteGroup donated the lot and the cost of construction for the new home through its Centex brand. The local building community also chipped in by hosting a golf tournament to raise funds to furnish the home. Thanks to the generosity and participation of Pulte's contractors, vendors and housing partners, more than $35,000 was raised for the family. "We are honored to participate with Operation FINALLY HOME to help put this brave veteran and his family in a better place. That is what the Centex brand is all about," said Steven Langridge , vice president of sales for the Dallas operations of Centex. "We hope this home will help improve the quality of life for Captain Vest and provide him and his family with enjoyment and security for years to come." Vest enlisted in the Air Force in 2000 as an airborne radio operator and in 2006 was commissioned to serve as a pilot. He has served in Operation Enduring Freedom and Operation Iraqi Freedom and has been recognized with multiple awards, including expert marksman, AF Outstanding Unit Award with Valor and the Meritorious Unit Award. Vest recently retired from the Air Force after being diagnosed with a rare autoimmune disease, which has limited him in is daily life. 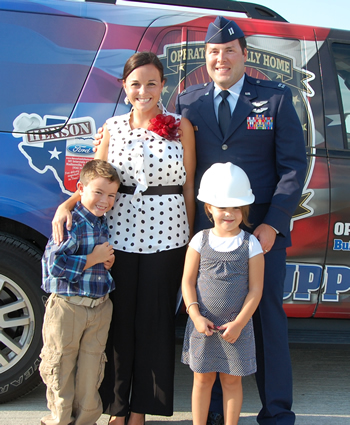 The new home will help him readjust to civilian life as he and his family return to his native hometown of Fort Worth. "PulteGroup and the Bay Area Builder's Operation FINALLY HOME are perfect examples of the great American spirit. They are providing my family with an incredibly positive return home in the aftermath and midst of very difficult times," Vest said. For more information about PulteGroup, Inc. and PulteGroup brands, visit media.pultegroup.com; http://www.pulte.com/; http://www.centex.com/; http://www.delwebb.com/. Operation FINALLY HOME is an award-winning program created by Bay Area Builders Association Support Our Troops whose mission is to provide custom made mortgage free homes to wounded and disabled veterans and the widows of the fallen in an effort to get their lives back on track and become productive members of their communities.